In this research, we develop a skeleton-based indoor rehabilitation posture monitoring system which is used to automatically detect whether the patient’s compensatory movement occurs during the rehabilitation exercise, and to give real-time visual and auditory feedback to prompt the patient to correct the abnormal posture. The system and model proposed in this research are established on the upper limb exoskeleton rehabilitation robot NTUH-II. The results show that the classification accuracy of the proposed method is better than the relevant studies. Besides, through the design of the window voting method, the real-time performance of compensatory movement detection is well, so that the system can be applied to the rehabilitation therapies. In this study, guide control of our recently developed 8 degrees-of-freedom (DOFs) upper limb rehabilitation exoskeleton, named NTUH-II, is proposed. The human arm dynamics and muscle activity can be measured by two Myo sensors. With such setting, the motion information of the user can be predicted by deep learning model from the measured arm dynamics and EMG data and be used as the desired motion trajectory of the exoskeleton. As a result, robot arm will follow the movement from the either side of user’s arm performed in reality. Various experiments have been conducted on three healthy subjects to verify the performance of the proposed guide control, and the results show that the proposed control scheme can reduce the mean absolute error and delay time of robot arm in guide mode. In this study, a sensorless active control of upper limb rehabilitation exoskeleton, named NTUH-II is proposed. Due to mechanical structure of NTUH-II, the friction behavior is more complicated than the commercial robot. However, the accurate friction model is crucial for constructing an interaction torque observer using Kalman filter, which is used to acquire human intention. Furthermore, the human intention needs to be take into consideration to derive the desired motion trajectory of the exoskeleton. The result shows that it can improve the smoothness of the motion and reduce the subject’s effort compared with the related works. Moreover, compared with the use of electromyography sensor and force/torque sensor, this method can get rid of additional sensors while achieving good performance. 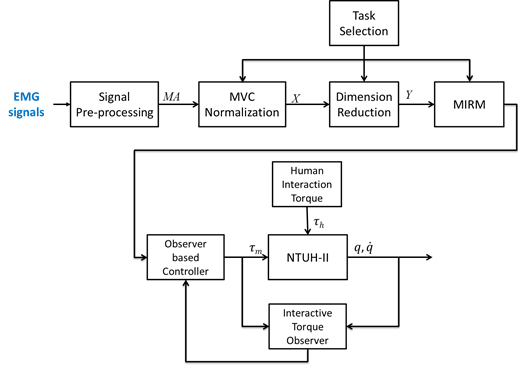 In this research, we construct the interactive torque observer based on robot dynamic model and measurements of encoder readings and motor torques. 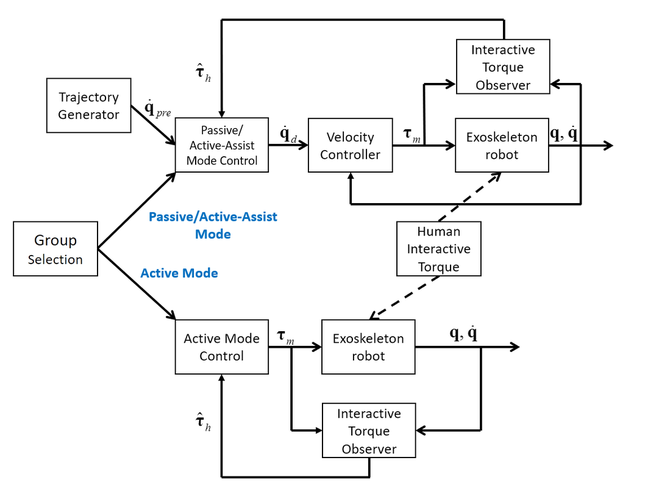 Then, based on the dynamic model and interactive torque, we propose a novel interactive torque observer based control for exoskeleton rehabilitation robot for realizing passive, active-assistive, active mode control. Several experiments have been conducted on three subjects which verify the performance of the proposed interactive torque observer based controller. The results show that the proposed control method can manipulate steadily in passive and active-assistive mode exercises. Moreover, the performance in active mode exercises show that it can improve the smoothness and reduce the subject’s effort comparing with one of the related work. 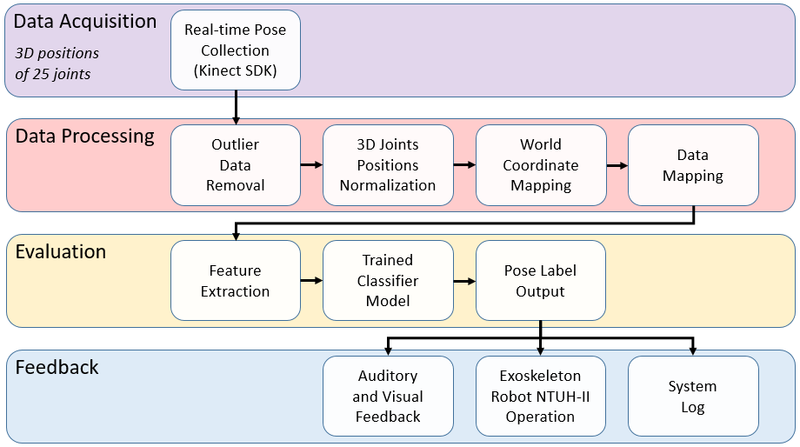 We proposed a new robot-assisted task-oriented rehabilitation therapy with electromyography (EMG) sensing-based motion intention recognition model (MIRM) for upper limb has been developed and implemented on NTUH-II. With the concept of motor learning theory, clinical study has shown that task-oriented rehabilitation is an efficient way to relearn the activities of daily living (ADL). The proposed MIRM can predict the intended motion direction of human in a task from the electrical activation of muscles. By the proposed MIRM along with our previous proposed interactive torque observer based active controller, not only passive mode therapy but also active and active-assistive mode task-oriented rehabilitation therapies are available for patients. Various experiments have been conducted on three healthy subjects to verify the performance of the proposed method, and the results show that the performance of the proposed method exceeds the state-of-the-art works and improves the performance of the active control. Led by Professor Li-Chen Fu, the Rehabilitation Robotics Group in the Department of Electrical Engineering at the National Taiwan University has been working on biomedical engineering projects related to physical rehabilitation and the development of medical instruments since 2005. The main focus is upper-limb exoskeleton type rehabilitation robot and its related technology of human-robot interaction, which were retrain motor movement of the limb. The aim of our team is to design both the hardware and software system to help stroke patients achieve as much functional independence as possible and to maintain quality of life by robot-aided assessment and training. The principle of the upper limb rehabilitation robot is to drive the patient's shoulder, elbow and other upper limb joints. Moreover, combining with the interactive game is tried to encourage patient to participant more and also increase patient confidence. In addition, real-time physiological information and game score can be analyzed and qualified as the effeteness of the treatment. With the robot-aided assessment of every time treatment, the therapist can clearly know the patients recover situation and adjust the proper therapies. We were interested in the system design, control strategies, virtual reality technologies, and safety issue during development. The trajectory desired and the kinematic of human-robot interaction were also considered. Passive therapy is mainly aimed at the patients who suffer from upper limb without any muscle strength or joint adhesion. During this therapy, the upper limb rehabilitation robot will push the patient's upper limbs doing stretch exercise (ex: shoulder flexion, shoulder joint abduction). So that, patients can use repetitive training to establish nerve and muscle connection and joint tension. Assistant therapy mainly aim at the patient whose upper limb has not enough muscle strength. In this therapy, the upper limb rehabilitation robot will have a predefined trajectory, patients need to drive the upper limb rehabilitation robot along this trajectory. When the patient lag behind the trajectory (muscle weakness, etc. ), the upper limb rehabilitation robot will give the patient assistance force to recover the trajectory. The therapy is designed to enhance the patient's muscular strength. Active therapy mainly aims at patients who already have some muscle strength but have poor control of muscle ability. During this therapy, we use EMG sensors and the interactive torque observer developed by our research team to judge (predict) the patient's motion intention. We use this signal to control the upper limb rehabilitation robot in order to train the patient’s control ability on muscle, and cooperating with the game can make the treatment process more interesting than the traditional physical treatment. We proposed a new circumduction therapy, the concept come from the traditional rehabilitation treatment which is circumduction exercise in the horizontal plane. Our team improves and designs circumduction exercise in the vertical plane. The purpose of this therapy is to make the shoulder joint can be movie in two axes increasing the coordination of muscle. This research is cooperating with National Taiwan University Hospital and is sponsored by National Science Council, R. O. C. and by National Taiwan University Hospital. The clinical trial was approved by Department of Health (DOH), R. O. C. and Research Ethics Committee B of NTUH since 2009. S.-H. Hsu and L.-C. Fu, “Adaptive decentralized control of robot manipulators driven by current-fed induction motors,” IEEE/ASME Transactions on Mechatronics, Vol. 10, No. 4, pp. 465-468, 2005. F.-Y. Hsu, and L.-C. Fu, " Intelligent robot deburring using adaptive fuzzy hybrid position/force control," IEEE Trans. Robot. Autom., Vol.16, No.4, pp.325-335, 2000. K.-Y. Lain, L.-S. Wand, and L.-C. Fu, " A skew-symmetric property of rigid-body systems," Syst. Control Lett., No. 33, pp. 187-197, 1998. K.-Y. Lian, L.-S. Wang, and L.-C. Fu, " Globally valid adaptive controller of mechanical system ," IEEE Trans. Automat. Contr., Vol. 42, No. 8, pp. 1149-1154, 1997. Yang, J.-H., F.-L. Lian, and L.-C. Fu, "Nonlinear adaptive control of flexible-link manipulators," IEEE Trans. on Robot. Autom., Vol. 13, No. 1, pp. 140-148, 1997. J.-H. Jean, and L.-C. Fu, "An adaptive control scheme for coordinated multi-manipulator systems," IEEE Trans. Robot. Autom., Vol. 9, No.2, pp. 226-231, (SCI) 1993. J.-H. Jean, and L.-C. Fu, "Adaptive hybrid control strategy for constrained robots," IEEE Trans. Automat. Contr., Vol. 38, No. 4, pp. 598-603, 1993. K.-Y. Lian, J.-H. Jean, and L.-C. Fu, "Adaptive force control for mechanical systems with flexible joints: A single link case," IEEE Trans. Robot. Autom., Vol. 7, No. 4, pp. 540-545, (SCI) 1991. T.-L. Liao, L.-C. Fu, and C.-F. Hsu, "Adaptive robust tracking of nonlinear systems and with an application to a robotic manipulator," Syst. Control Lett., No. 15, pp. 339-348, (SCI) 1990. L.-C Fu, and T.-L. Liao, "Globally stable robust tracking of nonlinear systems using variable structure control and with an application to a robotic manipulator," IEEE Trans. Automat. Contr., Vol. 35, No. 12, pp. 1345-1350, (SCI) 1990. H.-Y. Li, L.-Y. Chien, H.-Y. Hong, S.-H. Pan, C.-L. Chiao, H.-W. Chen, L.-C. Fu, and J.-S. Lai, “Active control with force sensor and shoulder circumduction implemented on exoskeleton robot NTUH-II,” IEEE/RSJ International Conference on Intelligent Robots and Systems (IROS), 2016. G. D. Lee, W. W. Wang, K. W. Lee, S. Y. Lin, L. C. Fu, and J. S. Lai, “Arm exoskeleton rehabilitation robot with assistive system for patient after stroke,” International Conference on Control, Automation and Systems Proceedings (ICCAS), 2012. L. C. Hsu, W. W. Wang, G. D. Lee, Y. W. Liao, L. C. Fu, and J. S. Lai, “A gravity compensation-based upper limb rehabilitation robot,” American Control Conference Proceedings (ACC), 2012. W. W. Wang and L. C. Fu, “Mirror therapy with an exoskeleton upper-limb robot based on IMU measurement system,” IEEE International Workshop on Medical Measurements and Applications Proceedings (MeMeA), pp. 370-375, 2011. B. C. Tsai, W. W. Wang, L. C. Hsu, L. C. Fu, and J. S. Lai, “An articulated rehabilitation robot for upper limb physiotherapy and training,” IEEE/RSJ International Conference on Intelligent Robots and Systems (IROS), pp. 1470-1475, 2010. Wei-Hsuan Chen, "Automatic Compensatory Movement Detection System for Upper Limb Robot Rehabilitation," Master thesis, Dept. Elect. Eng., National Taiwan Univ., Taiwan, 2018. Jialiang Ren, "Deep Learning based Motion Prediction for Exoskeleton Robot Control in Upper Limb Rehabilitation," Master thesis, Dept. Elect. Eng., National Taiwan Univ., Taiwan, 2018. Lee-Kai Liu, "Sensorless Exoskeleton Robot Control with Friction Estimation for Upper Limb Rehabilitation," Master thesis, Dept. Elect. Eng., National Taiwan Univ., Taiwan, 2018. Hao-Ying Li, ”Intention based Active Exoskeleton Control for Upper Limb Rehabilitation Therapy,” Master thesis, Dept. Elect. Eng., National Taiwan Univ., Taiwan, 2017. Li-Yu Chien, ”Interactive Torque Observer based Exoskeleton Robot Control for Upper Limb Rehabilitation,” Master thesis, Dept. Elect. Eng., National Taiwan Univ., Taiwan, 2017. Heng-Yi Hong, ”The Circumduction Therapy on Exoskeleton Rehabilitation Robot,” Master thesis, Dept. Elect. Eng., National Taiwan Univ., Taiwan, 2016. Wei-Ming Lien, “ Developing a Novel Bilateral Arm Training on Rehabilitation Robot NTUH-II for Neurological and Orthopedic Disorders,” Master thesis, Dept. Elect. Eng., National Taiwan Univ., Taiwan, 2015. 林佳勳(Chia-Hsun Lin), “針對五十肩病患之穩定性模型及力矩增益值動態調整方法應用於NTUH-II復健機器手臂 Dynamic stiffness model and torque gain adjustment method implemented on ntuh-ii robot arm for frozen shoulder rehabilitation,” Master thesis, Dept. Elect. Eng., National Taiwan Univ., Taiwan, 2014. Guan-De Lee, “Design an assistive control system for upper limb rehabilitation robot,” Master thesis, Dept. Elect. Eng., National Taiwan Univ., Taiwan, 2012. Li-Chun Hsu, “A gravity compensation-based upper limb rehabilitation robot,” Master thesis, Dept. Elect. Eng., National Taiwan Univ., Taiwan, 2011. Bing-Chun Tsai, “An articulated rehabilitation robot for upper limb physiotherapy and training,” Master thesis, Dept. Elect. Eng., National Taiwan Univ., Taiwan, 2010. Yen-Yu Chou, “Design and application of the rehabilitation robot for upper limb physiotherapy and training,” Master thesis, Dept. Elect. Eng., National Taiwan Univ., Taiwan, 2009. 王威文(Wei-Wen Wang), “慣性感測系統結合外骨骼式機器人針對中風患者進行雙側上肢訓練 Bilateral arm training (BAT) using an exoskeleton robot with IMU measurement system for stroke patient,” Ph. D. Dissertation, Dept. Elect. Eng., National Taiwan Univ., Taiwan, 2014.